This broadband RF Field Strength Meter for monitoring high frequency radiation with 50MHz to 3.50GHz measuring range is designed to measure the electromagnetic field value of the Radio - Frequency. That it can do a non-directional (isotropic) measurement with three-channel measurement sensor. the non-directional electric field and high sensitivity also allow measurements of electric field in TEM cell and absorber rooms. It's highly dynamic with its three-channel digital results processing. 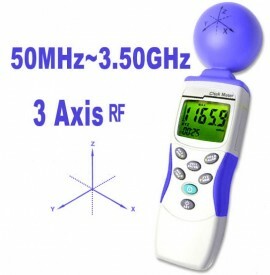 It is calibrated precisely on 50MHz to 3.50GHz frequency value. It has configurable alarm threshold. Memory function. overload & low battery indication and an adjustable auto power off and memory recall functions. With user-friendly interface that makes it easy and safe to operate. Instantaneous value, maximum value measured or average value can also be set to show on screen. The meter can be used to indicate the electromagnetic pollution generated artificially and can be used for all types of radio broadcasting and TV transmitters produce electromagnetic fields, and also can be used in industry, business and home where they affect us even if our senses perceive nothing.